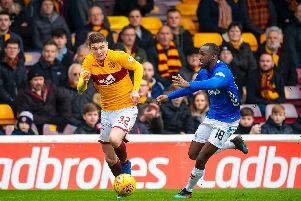 Greg Docherty knows he will have to up his game at Rangers after a bruising welcome by new team-mate Jordan Rossiter on his first day at the club. The 21-year-old joined his new colleagues at their Auchenhowie training base just 12 hours after finally sealing his £675,000 switch from Hamilton. But it was a tough introduction for the youngster as he was sent spinning when Rossiter punished a moment of hesitancy on the practice pitch with a crunching tackle. There was no harm done with handshakes all round after - but Docherty confessed it was a valuable lesson in the standards now expected of him. “That was a ‘welcome to Rangers’ message,” the former Accies midfielder said. “But that’s good. I’m used to seeing that sort of thing at Hamilton. “We got up and shook hands straight away. In fairness it was a great tackle. “Everyone is talking about it though - I did a couple of somersaults. Gers finally struck an agreement for Scotland Under-21 international with Hamilton chairman Ronnie MacDonald on Thursday night having come up short with last week’s opening bid. News of the move has gone down well with the Rangers faithful, who are hoping to see the boyhood supporter make his debut on Sunday when they travel north to Ross County. Much of that excitement is down to Docherty’s impressive statistics while playing for Accies this term. He leads the Ladbrokes Premiership’s dribbling figures while his assist rate is up there with any of the numbers posted by those playing for the top-flight’s high-flyers. But Docherty knows he will have to raise his game again if he is to make an impact at Ibrox. He said: “The hard work starts now. I’ve got to go and prove myself. “The last few weeks, the fans have been great with me. The messages I’ve received were full of support. Rangers beat off competition from Crystal Palace to land the promising youngster but Docherty admits moving south was never a likely option. He said: “It was a great feeling coming in here this morning. I’ve been looking forward to this day for a long time. “I’d always hoped this day would come but to be honest I didn’t think it would come this early in my career. “As soon as I knew Rangers were interested I knew it was the perfect platform to express myself. “The team’s doing well right now so I know I’ll have a fight on my hands to get in the team. I’ll have to be patient but that’s fine. “It was sold to me as a project here over the long-term. I’m just itching to get started.